Thought I'd give this week's sketch a try today. I'm not so sure I like the finished card but I decided to post it anyways. I think I might try this one again with a mix of patterned papers. Since one of the challenge on the Verve blog this month was to use chevrons, I embossed the green cardstock with a herringbone pattern which looks similar to chevrons. Today's card is based on this sketch by CAS(E) this Sketch and features stars for the Merry Monday Challenge. I wanted a card that was bright and colorful so I started with the paper from Recollections that I've been holding in my stash. The sentiment stamp is from Inkadinkado set called Warm Holiday Wishes and it has stars mixed throughout the lettering. The red and green stars in the lower corner are affixed with foam adhesive to give some dimension. Kraftin' Kimmie's Anything Goes was the inspiration for these two cards. Using the August sketch and the KKS stamp Birthday Lulu for the first card I created a cute birthday card. 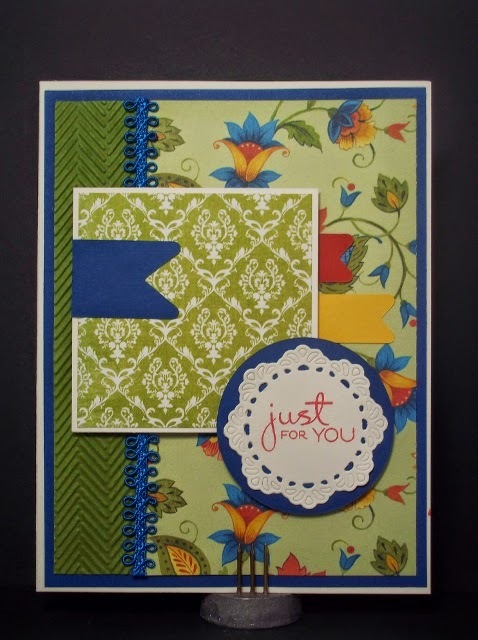 The second card was made with the Zinnia Bouquet stamp from Taylored Expressions. Turning the sketch and using different colors made them completely unique. Also entering the second card into the Paper Players challenge 358 for emphasis on coloring. By using monochromatic colors the focus is on the colored image.